This is one fun looking remote control humvee, not only can it drive around the ground in normal humvee brutish fashion it can also drive up walls! 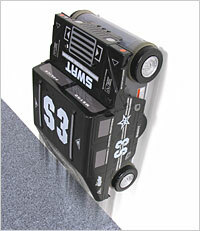 Yes you read that right, this remote control car can drive up (and presumably down) vertical surfaces. It works by using the opposite principle of the hovercraft and creates a sealed vaccum between itself and the wall when ever it is inclined at an angle of 45 degrees or more. It may not be as much fund as a traditional flying remote control toy but it will definitely have people scratching their heads. Available from Firebox for just under 80 pounds.